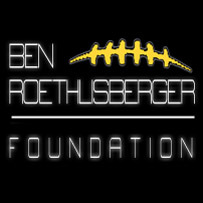 Today, Ben announced the eighth grant of the 2010 season from The Ben Roethlisberger Foundation. 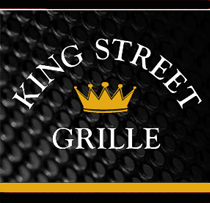 The foundation will be distributing a grant to the Montgomery County Sheriff’s Office, located in Rockville, Maryland, just outside of Baltimore where the Steelers take on the Ravens this Sunday. The Montgomery County Sheriff’s Office will use the grant to purchase explosive detection training supplies and equipment for the continued training of their explosive detection K-9 units. The grant will put more certified and much needed explosive detection K-9 units on the street to protect the lives and the property of the citizens of Maryland and the surrounding states. Ben’s foundation has been giving grants for use in the purchase of K-9 dogs and equipment, assisting with training and even veterinary bills, to police and fire departments across the country since 2006. The idea for the foundation came from Ben’s father, Ken. In 2006, a K-9 police dog in Findlay, Ohio named “Flip”, was shot and killed. 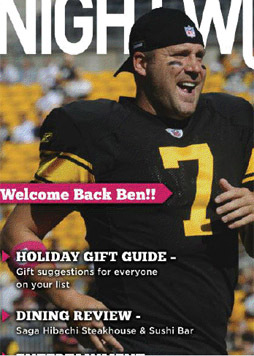 Ben is the cover boy for the latest issue (Dec. 1st-7th) of USA Today‘s Sports Weekly magazine. 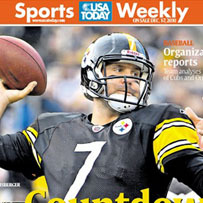 The cover is titled, “Countdown – In NFL, December is make-or-break time for playoff hopefuls”. Inside they give a complete rundown of this weekend’s games. You can purchase a copy wherever newspapers are sold or online here. *Thank you to Lexi for the purchase link! Bad news, and good news…. 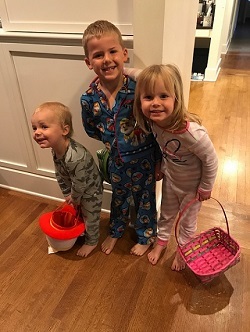 The bad — Ben reportedly has a broken fifth metatarsal bone in his right foot! 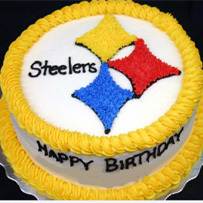 However, the Steelers have issued a statement regarding the injury. 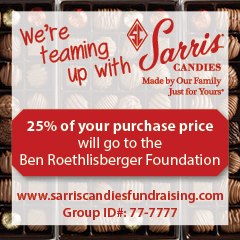 The good — Ben insists he will play this Sunday against the Ravens! 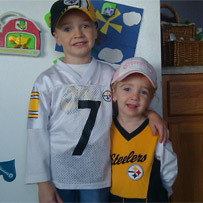 Rick Kennedy sent in a photo of his adorable children, Braylen and Jayda from last Sunday when they were geared up and ready to root for Ben and the Steelers against the Buffalo Bills! You can check out a larger version of their photo in the Lil’ Fans album here.